Every holiday I always return armed with Mom's special Green masala paste and her Meet mirsang paste ( spicy chilli paste) as they are so useful for cooking up dishes in minutes.. The wonderful blend of fresh coriander leaves, green chillies and whole spices adds so much flavour to any preparation. 1. Wash coriander leaves and take off leaves. Dry well on a clean cloth. 2. Clean and mince finely ginger and garlic. 3. Remove stems of green chillies. 4. Grind all the ingredients to a fine paste using a little water. Green masala is ready for use . a. the ground paste can be either fried really well in sufficient oil till it turns a dark green colour and oil starts leaving the sides of the masala, cool and bottle. b. the freshly ground paste can be preserved by using a preservative like sodium benzoate. Mom usually follows method (a). 7. 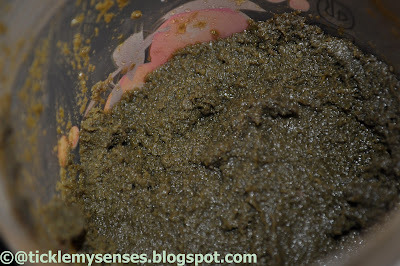 Bottle the prepared green masala paste in a sterilised dry airtight bottle and store in the fridge for a few months (5-6 months). Use a dry spoon as and when required. Remember to close the lid tight after use. Hi Sharon.....A warm welcome to TMC. Thankyou for stopping by and for your appreciation of my blog. I hope you did find some recipes that your really liked. Happy Cooking and do come back, I would love to hear your feedback on my recipes. I recently migrated to Bangalore and tried the Mangalorean cuisine at a local restaurant and wanted to learn some recepices. There are lot of sites and a 1000 results for a green masala search however for some reason I found this appealing and easy. I decided if it turns out well Will countinue looking at the other recepices in this site. 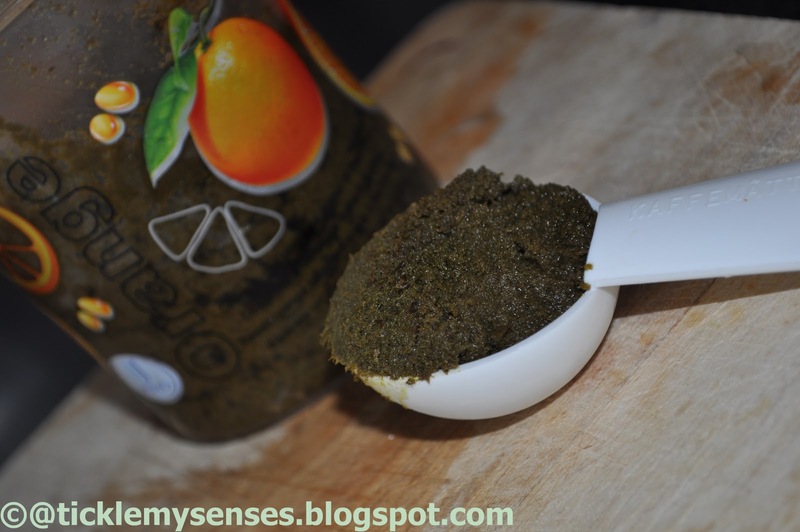 Tried this green Masala with pork and it is amazing.sooooo good, absolutely delicious. Thanks Carol for sharing this recepie. Welcome to Tickle My Senses. Im so glad the green masala turned out great for you :) Thankyou for letting me know. Made my day :) Hope you find many more recipes that you will equally love.